This interview pretty much echoes the positions I've been stating. However, I'm not as sanguine. According to Mitch Roschelle, partner at PricewaterhouseCoopers, uncertainty in global currencies, stocks, and bonds could benefit hard assets like U.S. real estate. "Whenever there's instability in a society or in the world, investors tend to rotate towards the non-trading asset," he said. This is what I've been openly predicting for years. I've only been surprised by how long it's taken to show up. ... the British Met Office, suggests that the average global temperature in 2016 will be between 0.72°C (1.29°F) and 0.96 °C (1.73°F) higher than the average temperature in the second half of the 20th century. Last year was the hottest year ever recorded and meteorologists say that 2015 will beat that record handily barring an unexpected change. Can you believe it that there're are people who still think human carbon-burning hasn't driven up the temperature. It's either that or they're saying it's good for plant growth. Actually, they don't appear to understand the data on that either. Plants don't all continue to handle ever-increasing CO2 with proportional growth-increases. If you love chaotic and more dangerous weather, you'll love the future (with its skyrocketing weather-related insurance premiums — if such insurance coverage will remain available at all) if we don't stop the carbon burning in time or take major sequestration or other steps to slow and stop and even reverse the warming. ... the government-engineered shift from an industrial to services-based economy hasn't been going smoothly this year. 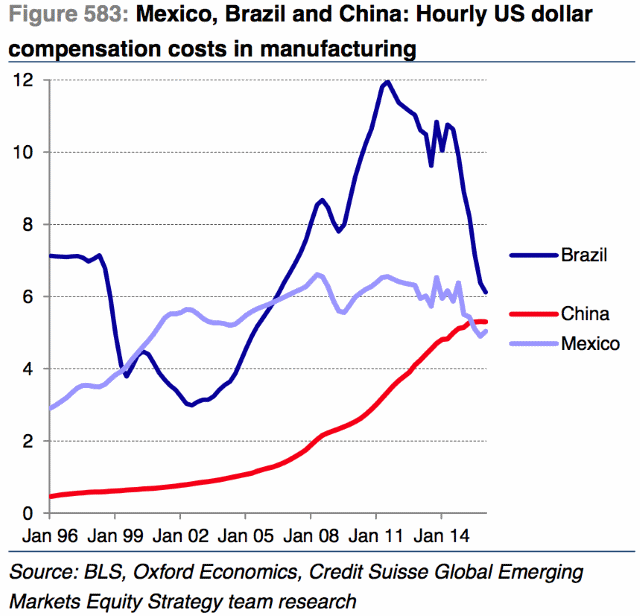 ... China's major competitive advantage — cheap labor — has dried up over the past couple of decades. And now, it is all coming to a head. "The interest of firms in both borrowing and spending continues to decline, suggesting it's past time the 'stimulus mafia' rethinks its Pavlovian responses," Miller wrote. "Reform or bust." The issue isn't whether to reform but which reforms to take. The worst choice would be laissez-faire. From her conversations with sources, this blogger understands the new "supply side" reform has 4 aspects. They are: 1. effectively resolve excess capacity to optimize production; 2. reduce costs and enable firms to stay competitive; 3. reduce excess property inventories to enable sustainable real estate development; 4. guard against and remove financial risks. "...reduce excess property inventories to enable sustainable real estate development..." means what? To actually do it, it would mean radically altering Chinese real estate developing and investing. It would mean that the Chinese people would have to be able to invest in more than the Chinese stock market and/or Chinese real estate. Exactly what does the Chinese Communist Party have in mind? With the move by Congress, companies "are going to have to figure out another way to unlock the value of their real estate without a spinoff," said Robert Willens, a tax consultant in New York. "No one is going to do a taxable spinoff." The vote on the legislation with the REIT provision was 318 to 109. It was a bipartisan effort led by Senator Orrin Hatch, Republican of Utah; Senator Ron Wyden, Democrat of Oregon; and Representative Kevin Brady of Texas, the Republican chairman of the House Ways and Means Committee. The tax legislation now goes to the Senate, where it is expected to pass. The move by Congress to end one kind of tax-focused deal follows recent public outcry about another: inversions, or the acquisition of a foreign company that allows a United States company to move its legal headquarters to a country with a lower tax rate. The I.R.S. and the Treasury have also proposed ways to curtail these kinds of transactions, which by estimates have cut into tax revenue by some $34 billion, and called on Congress to help. The bill "contains much more good news than bad news for REITs and the real estate industry," Mr. Glazer said. Under the new rule, a property is considered a chronic nuisance when three or more nuisance activities occur or exist during a 90-day period. Richland County Land Bank officials hope a new tool they are developing will improve communications between county and city agencies and allow them to provide better progress reports to the public on problem properties. Gillian Tett, John Authers and Cardiff Garcia discuss Janet Yellen's moveThe Federal Reserve has raised interest rates for the first time in nine years, but the future path of rates and the central bank's tools for controlling them remain uncertain, say Gillian Tett, John Authers and Cardiff Garcia. 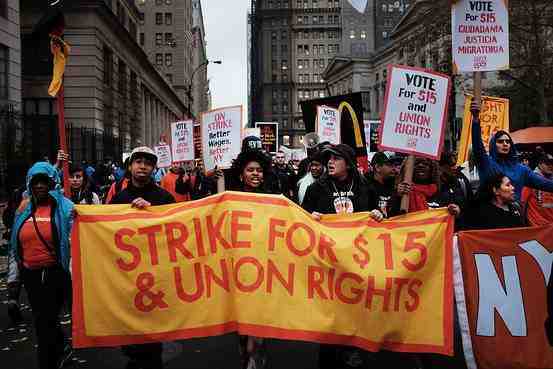 This move by the White House and Congress is designed for one thing and that's to keep wages low. It benefits those who want too many unemployed people fighting for jobs so they'll all be willing to work for less while those at the top get to keep more of the pie. It's very interesting that those we typically hear referred to as "liberals," traditionally ostensibly more for the little guy, are not the ones who are out front, aren't the first to hammer, on this issue. Now, you might be wondering whether the "conservatives" who are upset are really simply more upset at the immigration rather than the job competition. No doubt, there's some of that. But honestly, why in the world at a time when the Fed is tightening up, which will dampen job creation on purpose are we bringing in more "unskilled" workers when we have so many unemployed Americans still wanting to work? As I said, the Fed is for big bankers first, which are huge corporations both leading and serving other huge corporations whose top executives want to keep their huge compensation packages regardless of overall harm done to the US and global economies. The House omnibus bill, released last night [the article was posted 12/16/15], includes a provision that would quadruple the number of H-2B visas for low-skilled guest workers. The measure would increase the number of H-2B visa workers allowed in the U.S. in 2016 from 66,000 to around 264,000. John Authers explains how a fresh commodity sell-off prompted the US stock market to retrace the gains it made after Wednesday's rate rise. May 22nd, 2011. A powerful tornado cut a mile-wide swath through Joplin, Missouri. It was the costliest tornado disaster in history, with insured losses close to two billion dollars. It was also one of the deadliest, with 161 lives lost... and one thousand injured. The scale of the Joplin disaster drew teams of scientists hoping to find out what made this storm so destructive. And what can be done to protect communities and people in the future. What did they learn by peering inside the violent realm of a Super Tornado? You might think of slavery as a barbaric system from a bygone era. 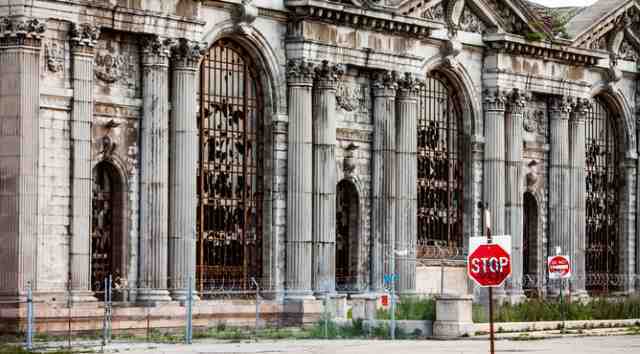 The deep and damaging scars are still visible, but thanks to the work of abolitionists such as William Wilberforce, Harriet Beecher Stowe and Frederick Douglass, the practice itself has been wiped out. But you'd be wrong. 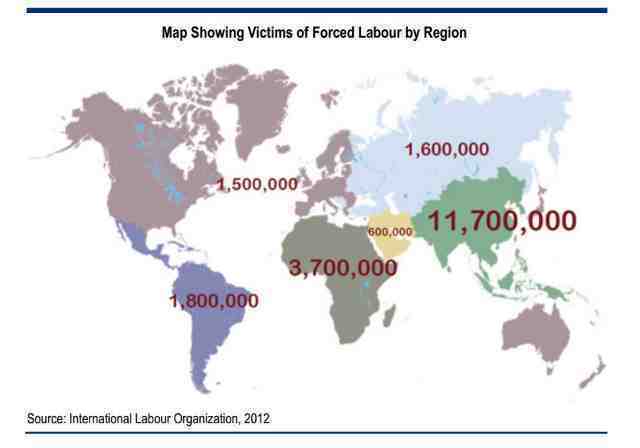 Today, nearly 21 million people are victims of forced labour. "In the area of credit risk, the warning lights are flashing yellow. Regulators and bank management need to act now to prevent those risks from becoming reality. We can't afford to wait until the warning lights turn red." Natural disasters caused a total of $1.5 trillion in damage worldwide between 2003 and 2013, according to a study by the United Nations Food and Agriculture Organization (FAO), which finds they caused more than 1.1 million deaths and affected the lives of more than two billion people. Cities are more likely to go through a "boom and bust" cycle than experience long-term stability, as they struggle to adapt to impacts of recessions and conflict. One striking example comes from North America: of the ten largest US cities in 1950, eight had lost at least 20% of their population by 2010, after they failed to adapt to economic and political shifts. Clearing away the myths around urbanisation is crucial, if we're to understand the more nuanced forces that are driving urban growth, and shape the future of our cities for the better. Let's trade in blind enthusiasm for a clearer vision of how our world is changing, and what governments and citizens can do to forge an urban future that works for all. Carol Pruitt-Moore, a seventh generation Tangier islander, said the half-century lifespan forecast for Tangier seems rosy to her. "I think it'll be less than 50 years," Pruitt-Moore said. "We are one storm away from being washed away or being forced to evacuate." It is true that regional governments took advantage of newly-devolved powers to approve another 155 plants for 123GW this year, alone equal to Brazil's annual use. Horrified officials in Beijing are trying to reverse course. The expansion makes no sense since coal thermal plants are already running at below 50pc of capacity. Greenpeace, which first revealed this planning frenzy, doubts that many of these plants will ever be built, and if they are built, up to $110bn will go up in smoke on stranded assets. There will never be enough demand for their electricity. It will be a repeat of the steel fiasco. I've been concerned China would not reverse the planned coal-fired plants. However, I think Greenpeace is right. 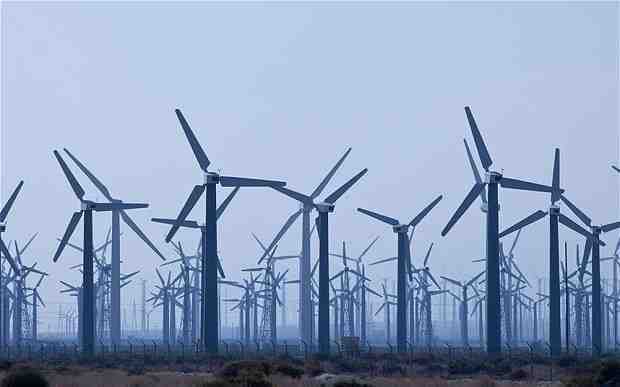 China is extremely serious about green energy and can shift almost on a dime. 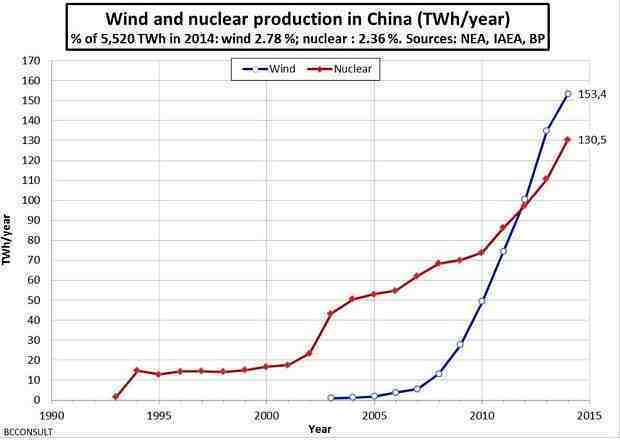 Ambrose Evans-Pritchard followed up on his previous article on China and its dramatic switch to green energy. "The coal industry is facing huge pressures, and the main reason is China," said Fatih Birol, the agency's director. ... we have spent the last three years constructing an econometric model of the UK economy following a broadly Keynesian framework, and based loosely on the post-Keynesian ideas of Godley and Lavoie's 'Monetary Economics'. Our CBR model includes the impact of borrowing and debt on household consumption and investment, and recognises the importance of what Claudio Borio of the Bank for International Settlements calls 'financial super-cycles'. These are credit cycles, which in the UK have tended to last for around 20 years. Our view is that the fourth post-war cycle began in 2012 and it is the upswing of this cycle that is generating the economic growth that offsets the impact of public sector austerity. Our projection is that the cycle will slow over this parliament and peak around 2020. ... In the current circumstances the Chancellor is, in our view, relying on the expansion of household debt to generate the revenues necessary to cut government debt. Our CBR forecasts serve as a warning shot to the Chancellor that although austerity may help to protect the public finances, a consumer credit boom and escalating house prices will lead to yet another boom bust cycle. Personally, I think they're being optimistic about 2020, but I'd have to read the whole report to check all the definitions, etc., they're employing. When reading the article, I thought to myself, the New Deal created the welfare state, as we know it, or knew it before deregulation mania, in the US. It was borderline social democracy. It worked and worked very well, though it could have been even stronger. I also thought about all the democratic decisions that went into the formation of the economy. That formation was far from simply the "free market" spending choices of the people. And what is left out of the article but democracy itself except where it is derided as "big government imposing social democracy." Also, Adam Smith was opposed to laissez-faire the way the term is used today by US economic "libertarians" or anarchists. No, unbridled capitalism is always a disaster for a national economy. It leads to government by the rich: plutocracy. It works to nullify democracy, democracy that is the direct opposite of central planning. It is democracy's enemy. It leads to consolidation of wealth, power, and control in the hands of the most ruthless, the most sociopathic, in their capitalistic endeavors, which is a very ugly and harmful thing. As far as I can see, that doesn't fit Matt Ridley's Sweden "point" at all. Do you think that if it did, Brad DeLong and Paul Krugman would have wanted the US to follow the pattern? Hardly. ... "the Basic Allowance for Housing (BAH) is a U.S. based allowance prescribed by geographic duty location, pay grade, and dependency status. It provides uniformed Service members equitable housing compensation based on housing costs in local civilian housing markets within the United States when government quarters are not provided." And there you see the importance of defining your terms. What constitutes "capitalism." The Marxist say the capitalist is the one in the private sector who owns the means of production. The libertarian will say that the Marxian definition allows for cronyism that those libertarians preclude from being part of what they consider real capitalism. Frankly, I think the Marxian definition if the right one and that the capitalists end up buying the state. The fact that it's cronyism doesn't negate that private capital purchased it. The Post-Keynesians will absolutely hate Christopher Phelan's article because they completely disbelieve that there is any lending constraint placed upon the commercial banks by the amount of excess reserves in the system. They believe (or at least used to) that banks lend first and then the Fed supplies the reserves (one assumes so long as the given bank is solvent and not liquid). 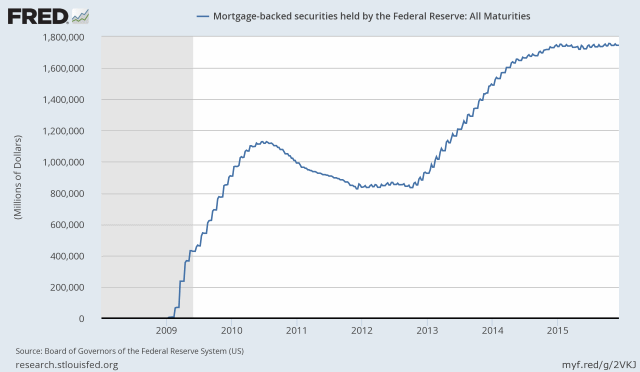 Banks lend their excess reserves to each other, but the Fed would not allow the system to run out of reserves is the Post-Keynesian's view, as best I understand it (and I've dealt with them a great deal). Let me remind my readers that the Fed refused to answer me directly as to the Fed's handling of the ratio. If someone else has had success in getting it straight from the Fed, I'd love to see it. The views expressed here are those of the authors, not necessarily those of others in the Federal Reserve System. However, the government borrows by issuing bonds paying a higher rate. Other nations are struggling to gain market share. They are engaged in trying to increase inflation -- to weaken their currencies. The US is paying a higher rate than before and the US economy appears relatively stronger and more stable. Therefore, people buy US bonds, which only serves to strengthen the dollar (increase its value), which is disinflationary in the US, as the dollar will buy more internationally and domestically. It's a two-edged sword though, as US exports become more expensive overseas. There are plenty of other variables involved besides, not the least of which right now is the low price of oil, which itself cuts both ways (disinflationary but also economically stimulative for the consumer if not the domestic oil industry). The increased debt servicing burden will put enough debtors into distress to cause credit growth to slow down, and when it does, so will the economy. 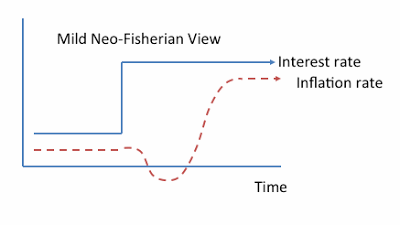 The Fed will then be forced to do what every other bullish Central Bank has been forced to do since this crisis began: reverse direction and cut rates once more as the economy tanks, rather than returning to "Equilibrium". It will never get back to its preferred Federal Funds rate of 4% until it learns, finally, that credit matters, and it starts to consider policies to reduce private debt to a manageable level—which is something like half its current number of 142% of GDP. In other words, the Fed was extremely premature. It didn't allow enough deleveraging in the private sector. It hasn't pressed the White House and Congress enough to step up the fiscal stimulus so the economy will heat up enough that the private sector can pay off its debts while the economy doesn't tank but actually grows in employment and wages. The thing is, mortgage rates have tracked US Treasurys even while the Fed has been buying MBS's. It hasn't appeared that merely buying up the MBS's has controlled the rate (at least post-QE liftoff). It's an interesting question whether tapering off rolling the money over into MBS's would raise rates. 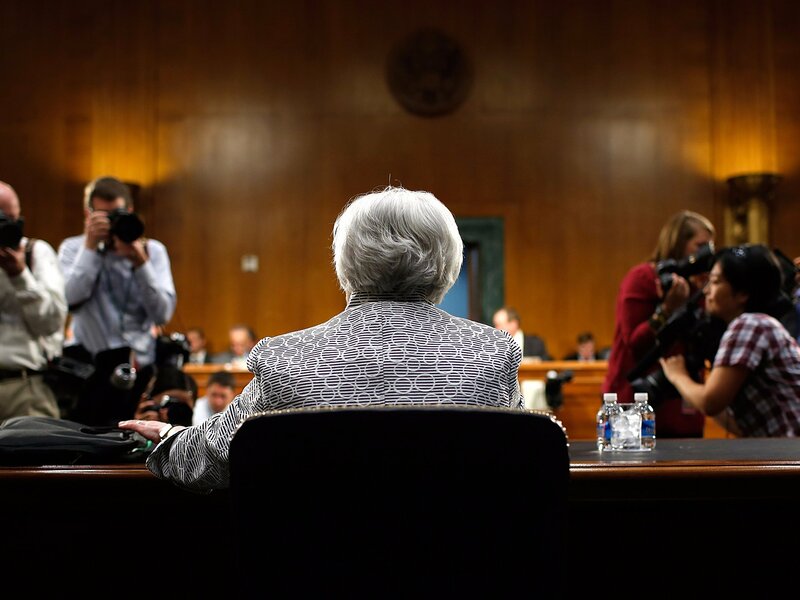 Who'd step into the Fed's buying shoes? Would it be enough? Companies would have to disclose publicly whether they have anyone on their board who is a "cyber security expert" under legislation introduced in the U.S. Senate on Thursday. The bill would require the SEC and the National Institute of Standards and Technology to provide guidance on the minimum qualifications for what is considered a cyber security expert. At the current rate, algal blooms, which can ultimately rob water of oxygen, will increase 20 percent in lakes over the next century, the study said. Algal blooms that are toxic to fish and animals would increase by five percent. These rates also imply that emissions of methane, a greenhouse gas 25 times more powerful than carbon dioxide, will increase four percent over the next decade. The court's decision upheld the conviction of Michael Reeder, who authorities said swindled an octogenarian out of $1.7 million in a scam real-estate deal. Before bringing charges, a King County deputy prosecutor went to a special-inquiry judge and obtained 20 subpoenas for Reeder's bank records. The moral of the story...? It's not cut and dried, not just one issue. Regardless, real-estate fraud is one of the issues and is quite risky behavior, to say the least. Don't do it not just because you could get caught but also because it's just plain wrong. Fire officials said saturated soil, weak roots and a breeze may have caused the collapse. Liability? Coverage? The auto policy may kick in first, depending upon whether the owner has covered it with "comprehensive" coverage. The tree owner may be responsible depending upon negligence. File an auto-policy claim if there's comprehensive, and make sure your broker and insurer/carrier know whose tree it was and if you know of negligence concerning the tree: warnings about it, dead limbs/trunk that fell and damaged the vehicle, etc. 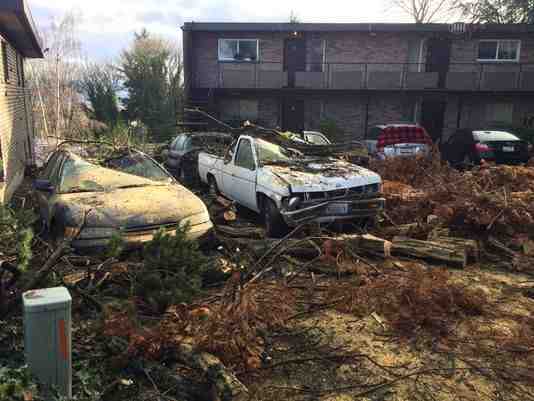 Of course and subject to the policy's subrogation language and any contract clause you may have with the tree owner regarding it (subrogation), it's up to you to decide how far to press the issue if you're a tenant and especially if the vehicle wasn't worth that much before the damage or totaling. 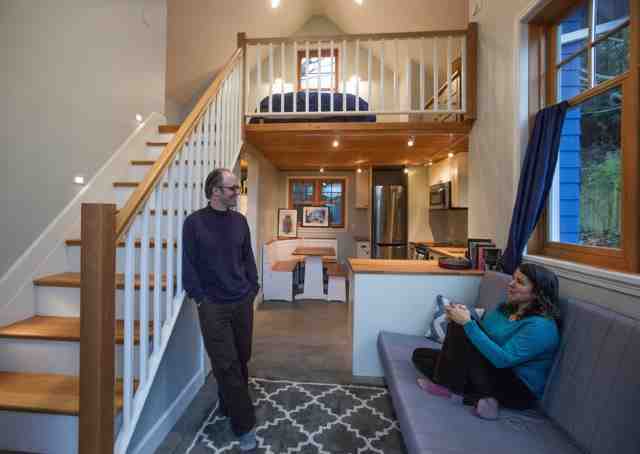 Seattle city officials want to permit more backyard cottages and other "accessory dwelling units." But it turns out the little houses face some big challenges. Look at that photo. 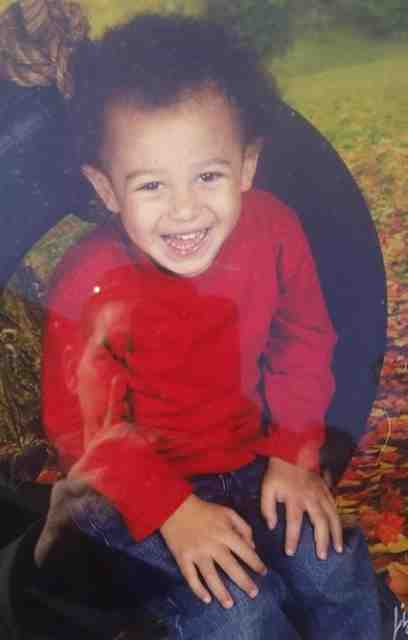 I'll have to look for more info on this tragic event. Three people were injured and 27 remain missing after a landslide buried 22 buildings in an industrial park in Shenzhen city of south China's Guangdong Province on Sunday, according to latest official figures. Several people were injured and several others missing on Saturday after an avalanche buried about 10 houses on the Svalbard archipelago in the heart of the Norwegian Arctic, local officials said. 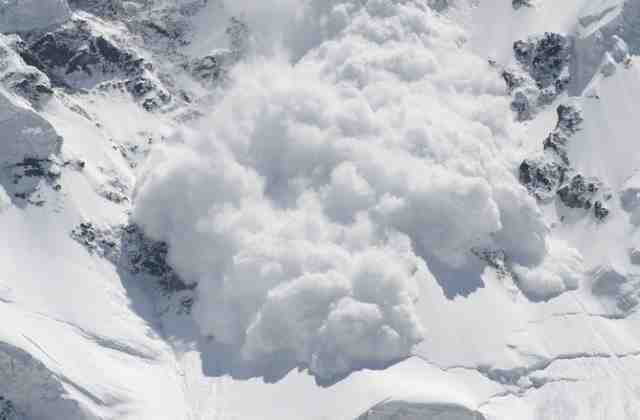 Is that a photo of the avalanche happening or of a different one? A Manhattan landlord is on the hook for $250,000 in city fines for turning his five-floor walk-up into an illegal hotel — so he's suing a tenant who he says repeatedly flouted building rules by renting her apartment to Airbnb travelers. "We were unaware of the rental scheme," said Lawrence Silberman, attorney for the owner of 357 W. 54th St. "We did not participate or profit from it. But this is now a policy of the city. The tenant does not get named or fined. The landlord's strictly liable." If the landlord is telling the truth about this and the landlord's attorney has characterized it correctly, then the law that targets the landlord and not also offending tenants is in need of rewriting. Some longtime tenants say they were forced out of their apartments so the landlord could turn the property into a more lucrative Airbnb. Well, check the laws very closely, monitor court cases, verify insurance requirements, and consider existing tenants perhaps not wanting the additional "guests" coming and going from the temporary "hotel rooms." 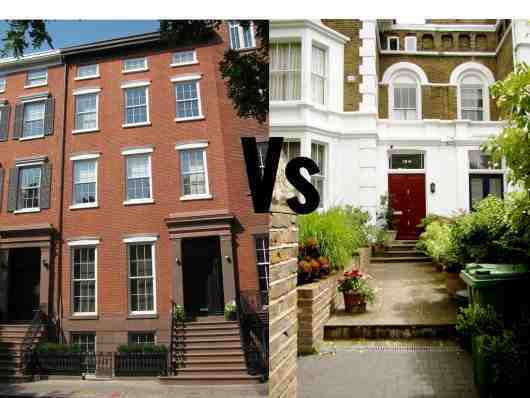 ... the overall average price for a family home in the hottest neighborhoods in Manhattan is actually higher than in London. But we get more for our money. "This tax-law modification is a game changer" that could result in hundreds of billions of new capital flows into U.S. real estate. No doubt, but will it bring forward a proportional increase in affordable housing and where it's most needed? Investors pumped plenty of money into Houston commercial real estate in 2015, but low oil prices could dampen activity next year. 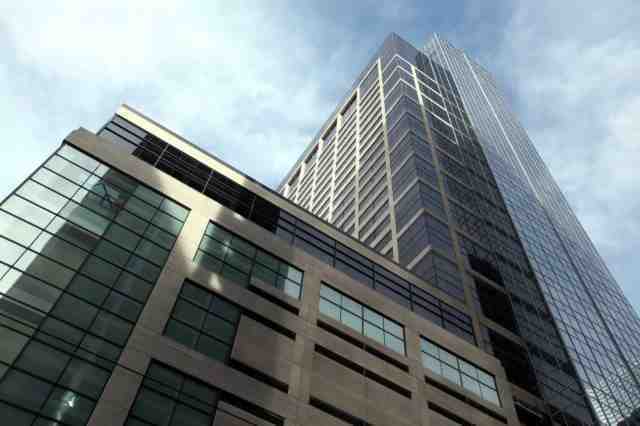 Overall office vacancy rates are 16 percent and rising as energy companies cut jobs, consolidate and put sublease space on the market, according to commercial real estate firm JLL. So owners of buildings filled with companies in good financial shape will likely keep their properties rather than sell them in a less-than-stellar market. Only the apartment sector, which accounted for $4 billion, or 35 percent, of the total sales so far in 2015, was bigger than the office sector. The top apartment deal, according to Real Capital Analytics, occurred on Post Oak Boulevard, a street that's drawn a lot of international investors recently. California-based IMT Capital paid $90.1 million for Uptown Post Oak, a 392-unit community at 1111 Post Oak. That works out to nearly $230,000 per unit. The complex was purchased from Plano-based Monogram Residential Trust. As discussed yesterday, the Fed Funds rate is expected to be about 8bp above the RRP rate and rise about 20bp (not 25bp) - from 13bp to 33bp. 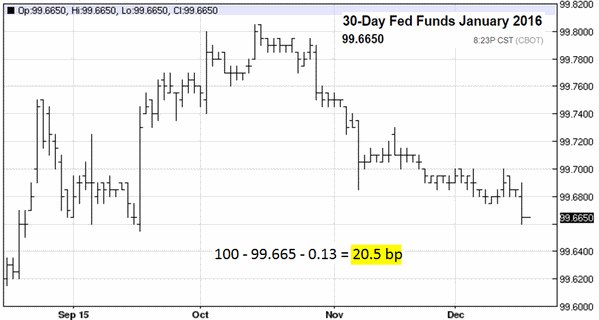 And that's what the January Fed Funds futures are now pricing. Another technical note related to the RRP change is the fact that if the program is widely used - and most expect that it will be - it will drain a material amount of excess reserves. Just as political democracy need not wait for incomes to rise, strong labor standards need not lag behind economic development. 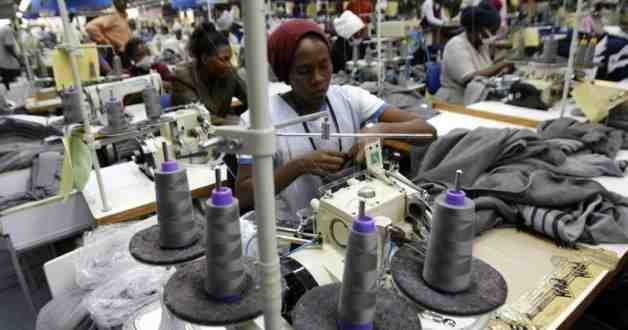 Workers in low-income countries should not be deprived of fundamental rights for the sake of industrial development and export performance. Who controls the state decides. If money controls it, then money decides. If the people control it, then the people decide. The people are either slaves of money or money serves the people. Last week's quarter-point rise in interest rates by the US Federal Reserve has helped to dampen interest among buyers, even as local banks have yet to factor the tightening into their mortgage rates. 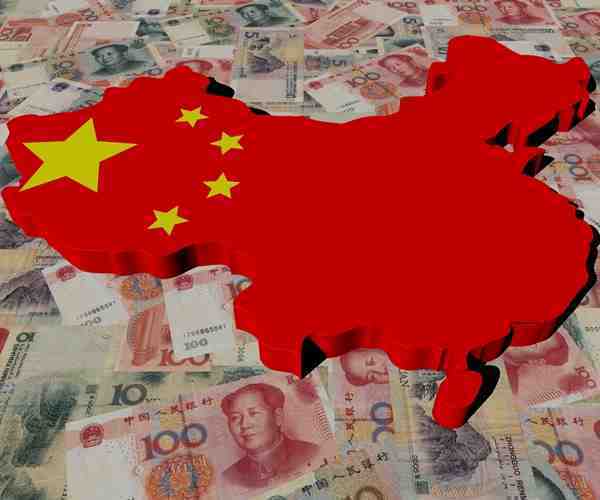 Expectations of additional interest rate rises next year, coupled with concerns over China's slowing economy are expected to take a further toll on confidence, pushing the housing market into a deeper downtrend. Some experts forecast home prices to fall up to 30 per cent next year, while others believe only a 5 per cent dip is likely in 2016. 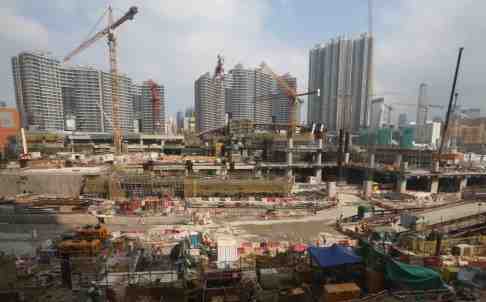 ... a sharp increase in units for the rental market will put downward pressure on rents. ... property consultant JLL was among the most optimistic, saying the latest round of policy tightening by the Fed would have minimal impact on the market. It forecast home prices would fall just 5 per cent next year. JLL always seems to be the most optimistic of the major players. When I read JLL's assessments, I always think they may be "psyching up the market." It's going to be a few years more before I can decide whether they've been generally right or not. Sometimes, it appears that semantics can muddy the waters too. They're always worth reading, however, for insights others don't always touch upon. 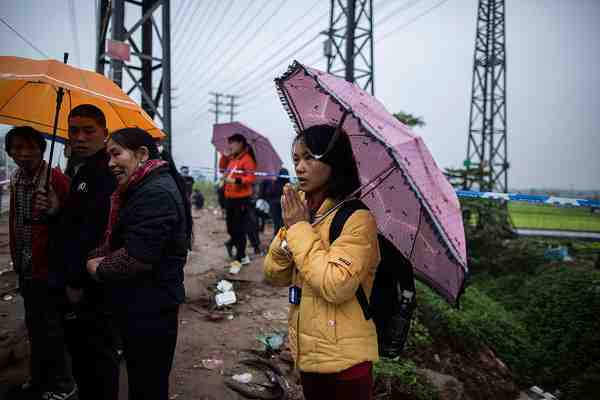 Rescuers searched for survivors in a sea of red mud on Monday, a day after dirt and construction debris engulfed dozens of buildings in this city in southern China, the latest of several man-made disasters in recent years to raise questions about the perils of the nation's rapid growth. Well, that certainly fits the first images that were coming out about this tragedy. It also points out the huge dangers of unbridled/poorly regulated economic development. It's simply bad ideology to assume that laissez-faire markets will sufficiently self-regulate before future disasters. Historically, the rush to get rich has always pushed good risk-management to the back. "Spain is not like Germany and will not form a grand coalition," said Rodrigo Serrano, a retired 67-year-old at a Ciudadanos supporters event in Madrid. "Now everyone will have to listen to each other, negotiate and talk. And put Spain and its government and stability ahead of everything else." "We could now be facing an era on political paralysis and instability in Spain unless a more likely coalition of the left is formed, which again could create an even bigger headache for eurozone leaders insisting on fiscal responsibility," said Craig Erlam, senior market analyst at OANDA in London. "Fiscal responsibility" as meant by neoliberals (and ordoliberals in Germany) is actually irresponsible. The responsible thing to do, the adult thing to do, is to get rid of government borrowing and to base the new debt-free currency's supply on real economic growth (not merely "financial" sector growth) and without unchecked inflation or deflation. Neoliberalism is an immature approach. The smart thing would be for the Socialists (lately in name only) to reach out to Podemos and to take Podemos very seriously. If handled correctly, Spain could undergo a needed rebalancing so that wealth and income inequalities could be greatly lessen while Spain's economy could grow solidly. With many in Spain still suffering the lingering effects of an economic crisis that sent unemployment rates soaring and triggered painful austerity measures, millions of voters turned away from the PP and Socialists, who have alternated in power for decades, and instead looked to emerging parties. Fire command says the home is a total loss as of now and it is likely to be razed. 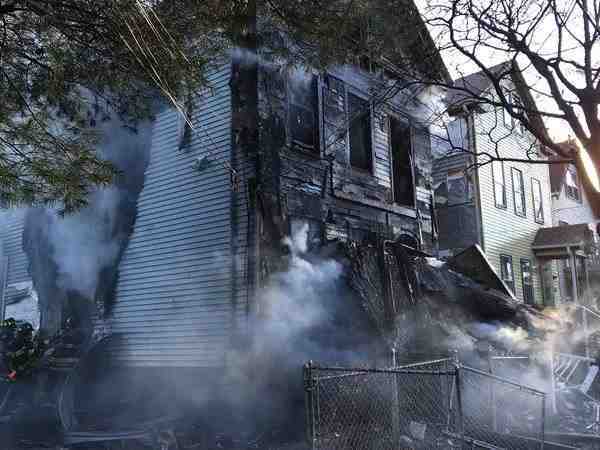 The modest two-story home on Mount Pleasant Street has been twice marked by tragedy — once in November 1952, when a fire killed a woman and eight of her children, and again Saturday night, when a 4-year-old boy trapped in his bedroom died in a blaze. A very brave teenager is discussed in the article. You should read it. We have some idea as to the price needed to cause another shale land rush. While year-end 2015 data won't be available until the first quarter of 2016, industry experts at RBN Energy estimate that many shale fields are still (marginally) profitable at $40 per barrel assuming that drilling costs have dropped 25% since 2014. Data already show that costs have dropped from 20% to 30%, and more efficiencies are still coming. Thus the magic number that could spark a new boom is something not too far north of $45. The Russians think that $40 to $60 per barrel is the new normal for the next decade for a good reason. The global oil market is undergoing a once-in-a-generation transformation. The future is now destined to be one of serial gluts with prices capped by the rapid addition of thousands of shale wells that can over-supply markets every time prices rise a little bit (by historic standards) for only a short time. There is no doubt that the world will use more oil; it is vital for modern societies and for all practical purposes nearly irreplaceable. Nearly irreplaceable? That part is nonsensical. Alternative energy is coming on strong. Carbon as fuel will nearly completely disappear regardless of how cheap it gets unless humanity finds ways to handle all the current negatives associated with that industry. Considering that clean alternatives are so readily available and only increasing, why bother to fix the entire carbon-fuel industry rather than push the clean alternatives we already have? Should we work on carbon sequestration at the same time? Yes, but certainly not to the exclusion of pushing hardest on clean, non-carbon alternatives. Baltimore, Maryland — A federal grand jury indicted Greg Ramsey, age 54, of Baltimore, with conspiracy to commit wire fraud, use of a fire to commit a federal felony, malicious destruction of property by fire, attempted witness tampering, and related gun charges. Ramsey and his niece, Tyesha Towanda Roberts, age 37, also of Baltimore, are charged with attempting to obstruct a federal investigation. The indictment was returned late on December 17, 2015. ... the pay of the average FTSE 100 CEO rose to being 183 times that of the average full time UK worker, up sharply from 160 times in 2010. And, while research repeatedly shows that high pay is often neither linked to performance nor improves it, recent finding from the Chartered Institute of Personnel Development shows high pay ratios have a strong demotivating effect on other staff. The article does give the "Tiny Tim's Ten Point Plan." I could easily quibble here and there with it; however, essentially, I find its spirit as generally heading in the right direction from where we are as a society and world. I don't know that Yellen understood the question. But she should have. Dudley has been telling this story for a long, long time. Does she and/or the Committee share his expectations? Why or why not? In my opinion, this is an important question, and it looks to me like Yellen fumbled it. Bottom Line: We have a fairly good idea of the Fed's reaction function with respect inflation and unemployment. Not so much with respect to financial market conditions. Who shares Dudley's views? That is a space I am watching this year. I didn't hear her fumble so much as that the question was vague enough that she didn't have to answer in a way that would meet Tim's satisfaction that she understood and answered Tim's question(s). Drillers in the U.S. put the most rigs back to work since July, adding 17. ... the U.S. on Friday passed legislation that lifted a 40-year ban on crude exports. At the new, higher rate, this is about $10.5 billion per year that is nothing but a gift to banks. And don't expect your deposit rate to move higher anytime soon. Banks pay interest to depositors to attract and retain cash. Right now, they don't need your money. And when the banks do lend, they'll lend at the higher rate. Two weeks ago, Dominic Konstam predicted, accurately, that the Fed's rate hike will be tantamount to policy error (as we showed by the market's response on Thursday and Friday). Borrow to cut taxes on the rich, how foolish, how greedy! Gov. Sam Brownback and Republican legislative leaders have elevated the practice of confiscating highway funds to pay for other state obligations to a new level. Of course, they'll look to cut government as soon as they can get away with it. Meanwhile, the State is being ruined for the short-term gain of a few elites who want it that way because their time is short and they want to have what they can get regardless of posterity. Property managers have also worried that Airbnb allows people into their apartment communities who have not gone through the property managers' own process to screen residents, which often includes full background checks. Airbnb's promise to focus on "primary residents" may allay some of those fears. 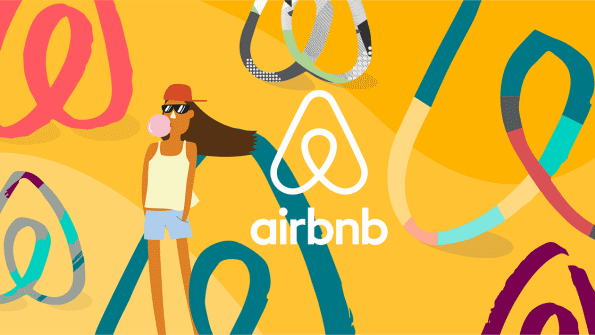 Primary residents are sharing their homes, including their furniture and appliances, when they rent their units through Airbnb. They are likely to be motivated to take care as they choose their visitors. The site gives hosts tools to help them decide who they allow into their homes, according to Airbnb. Personally, I don't think that's good enough. Has the Fed been premature? ... to highlight the fine line between apparent full employment and signs of slack, one only need look as far as Omaha. 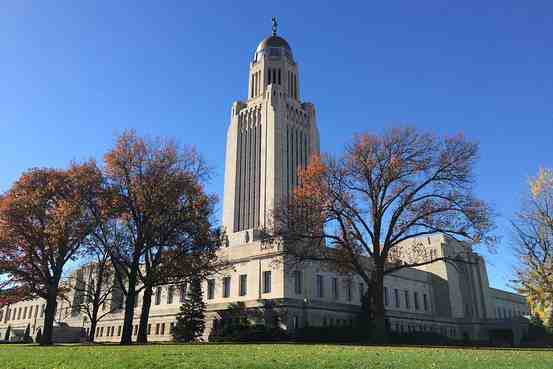 The larger city is only about an hour away from Lincoln and, with the unemployment rate at 2.9%, many companies there also worry about finding enough workers. But wages haven't taken off. Indeed, for the first time on record, average hourly earnings in the Lincoln metro area surpassed those of Omaha earlier this year. That study examined the effects of minimum wages on SNAP enrollments and expenditures. It concluded that a 10% increase in the minimum wage does reduce SNAP enrollments and expenditures by levels that would have saved taxpayers nearly $4.6 billion a year—6.1% of SNAP expenditures in 2012—if a federal bill seeking a $10.10 minimum wage had been approved. Mr. Sabia said that study's model was flawed in part because it didn't examine the impact among workers and nonworkers. A portion of his study set out to examine that using the same model and produced results that made the prior study's findings hard to believe, Mr. Sabia said. Ms. West acknowledged that her study didn't examine the effects on workers versus nonworkers, but she said she stands by her results. "The goal here is to see the overall fiscal response to social-assistance spending to the increase in the minimum wage. We're not being pedantic about it," she said. She added that she hadn't seen Mr. Sabia's research and emphasized that a higher minimum wage is not a panacea for curbing public assistance but "an important policy tool." The earned-income tax credit is a complement to that, "not a substitute," she said. Unless European leaders incorporate a long-term vision into their approach to migration, the probability of emergencies similar to this year's refugee crisis will continue to rise. And that approach needs to acknowledge how domestic European policies contribute to the movement of people from the developing world. 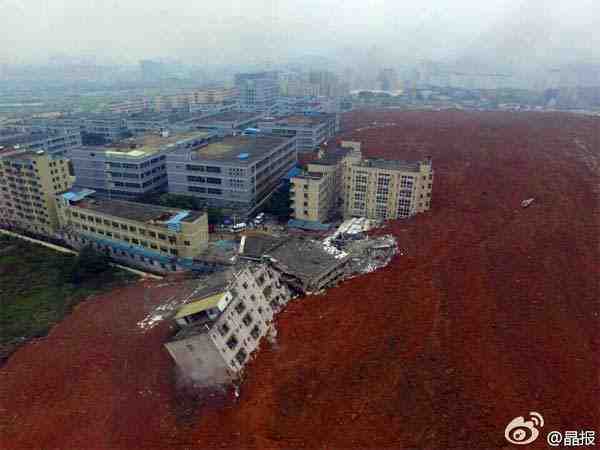 Part of an industrial area of Shenzhen was buried on Sunday after a rubbish dump collapsed, triggering a mudslide. More than 90 people are missing. The FT's Ben Bland reports. This reiterates the general consensus of news reports, as you've seen from the above links. It does put video to it and adds a few additional, albeit minor, observations. This entry was posted in Editorializing, General Insurance Research, General News of Interest, General Real-Estate News, News-Alerts Digests. Bookmark the permalink.